The cast of “Not One Batu” rehearses outside the Berger Park Cultural Center Coach House in Chicago. 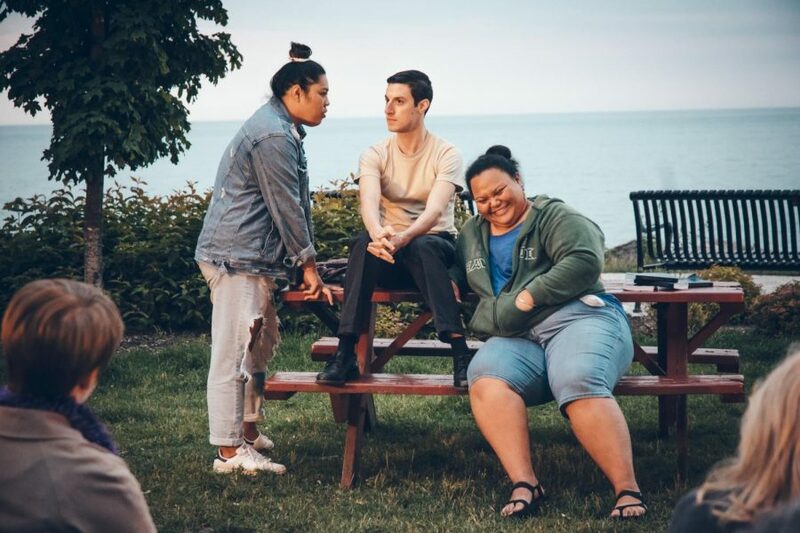 Northwestern alumna Hannah Ii-Epstein wrote the play, which originally ran in her native Hawaii and made it’s mainland U.S. debut on June 27. The beaches along Lake Michigan might not be the sandy shores of Hawaii, but for Northwestern alumna Hannah Ii-Epstein (SPS ’18) it’s a close enough substitute. Ii-Epstein’s play, “Not One Batu” takes place on the northern coast of Hawaii and tells the story of Honey Girl, a former methamphetamine addict turned expert drug dealer, according to the play’s synopsis. Over the course of the story, the audience sees Honey Girl meet with customers and friends, rival dealers, and her addict mother. Audiences also get to experience Pidgin, a distinctive Hawaiian dialect in which the play is written — “batu” is the Pidgin word for meth. Ii-Epstein, a native Hawaiian, said she wrote “Not One Batu” in 2014 after being in recovery from her own meth addiction for close to ten years. Through writing, Ii-Epstein found a positive channel for her addiction. The play won multiple local awards after it was first performed in Hawaii, where it hit home with those who had experienced the rise of meth that began when the drug was introduced to the islands in the 1980s, Ii-Epstein told The Daily. “While it sounds very heavy-handed, there’s a lot of heart and a lot of comedy in it,” Goldberg said. The mainland American version of the play is split into two acts, the first of which was added specifically for non-Hawaiian audiences. “The first act is kind of an immersive, almost luau environment to bring you into the world … where you get to interact with everybody before the play actually starts,” said Marie Tredway, who plays Honey Girl. During the first hour, the characters mingle with the audience, speaking Pidgin to familiarize them with the dialect, and teach them traditional Filipino games. The Aloha Center, the only AAPI cultural center in the Midwest, will also host a short set showcasing traditional Hawaiian music and dance. With any luck, the audience will leave the play with both Honey Girl’s story and a new understanding of Hawaiian culture.